Pineapples offer a warm welcome and are great for a Hawaiian luau, a tropical party, a beach or island themed event. Delight your guests with a gold metallic bookmark that they can use at home or at work. This magnificent favor is made of metal with a gold shiny finish. It has a cut-out design that forms the shape and detail of the pineapple. Attached to the top of the pineapple is an ivory colored satin tassel. 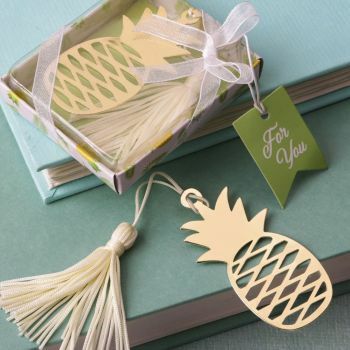 For a perfect gift, the pineapple bookmark is packaged in a pineapple design box with a green box bottom. It has a clear acetate top for a great display of the bookmark. The box is wrapped with a white organza ribbon and bow. Attached to the bow is a green matching 'For You' tag.